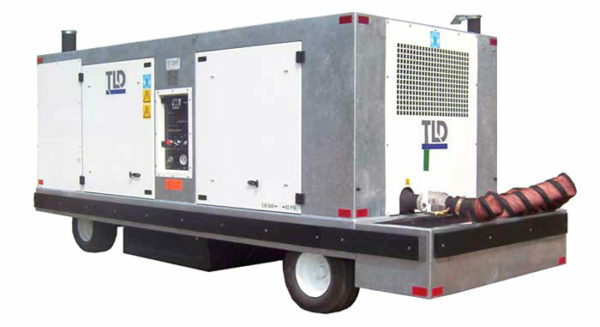 Major components include an air-cooled rotary screw compressor, the latest emissions-compliant diesel engine, and the proven ACE air regulating system. Standard features include dual mode operation, automatic throttle roll-back and an easy access canopy mounted on a rugged, galvanized steel chassis. These components and features combine to produce the most versatile and cost efficient air start units on the market today. “Oil-free dry-screw” rotary compressor. Precision cutting of compressor rotors eliminates the need for teflon or other coatings, which can fail due to differential expansion between rotors and casing. Easy to operate, with engine / compressor instrumentation on control panel. Torsional isolation between male compressor rotor and built-in multiplying gearbox. Integrated housing, bolts directly to engine flywheel eliminating alignment problems. Automatic throttle roll-back system, to decrease engine speed when full output is not required, reducing noise and fuel consumption. Two-mode operation - Air packs and jet start modes have independently adjustable supply pressures. Aircraft safety systems – designed to protect from overpressure or loss of pressure during starting procedures. Safety systems, designed to protect the unit from damage due to high temperature or a loss of oil pressure. Wide doors allow unhampered access to all components for ease of routine maintenance. Outlet air temperature of 390°F (200°C) assures quick starts. Tie down and Lifting rings.